Shop owners from around the country are coming to AAPEX/SEMA to find ways to grow their business. From informative sessions on operations and marketing to new product demonstrations, the whole reason for attending this annual convention is because you are a progressive entrepreneur in the automotive aftermarket and repair industry. What’s the most important goal once you have booked a new client? Utilizing tools that will turn a 1-time client in a lifelong client. MobileSoft is a trusted technology company in the automotive industry that has reinvented the way auto shop owners can communicate with their clients, deliver simple loyalty programs and provide value to their current brand. That’s where the custom mobile application comes into place. MobileSoft designs and publishes native Android and iPhone apps specifically for shop owners to communicate and retain clients. 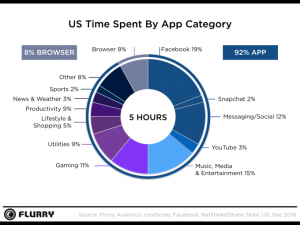 We are spending more time in mobile apps and that data is continuing to grow; according to new data released by analytics firm Flurry, we’re up to 5 hours per day on our mobile devices. This follows on news from January that said the time spent in mobile apps had increased 69 percent year-over-year. You spend the money to get the customer, now see how easy it is to retain them and build repeat business with a custom mobile application from MobileSoft, the leader in mobile app technology in the automotive aftermarket industry.